I am rolling out Chess for Android version 5.4 on Google Play. 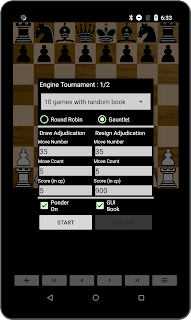 Besides minor improvements, the major new feature consists of draw and resign adjudication during chess engines tournaments. As shown below, a new tournament dialog has been implemented which shows, besides familiar older options, a section for draw and resign adjudication. If during a game, after the given move number and during the given move count, the score drops below the requested draw score (in cp) or exceeds the requested resign score (in cp, either consistently for white or for black), the game is adjudicated rather than played in full. This feature has been requested many times by tournament managers to avoid wasting time playing e.g. boring drawn games until the 50-move rule applies. See this talkchess posting for an example game.